A Little Perspective… How Big is the Hand of Hercules? And I realized that my memory of this spot, of everything surrounding this hand—the grey hazy air, the languid breeze against my cheek as I framed the shot—that’s only one perspective on the photo. 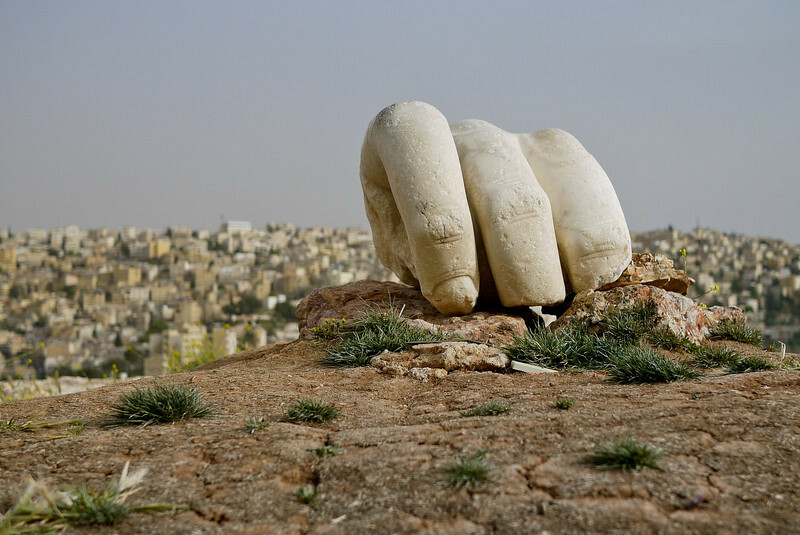 Hercules’ hand, a fragment leftover from a statue that would have stood at the Temple of Hercules on Citadel Hill in Amman, Jordan. But what is the truth? Can you tell from this shot the size of Hercules’ hand? How big would you reckon it is? The hilltop holding Amman’s temple seems unremarkable as far as hills are concerned. 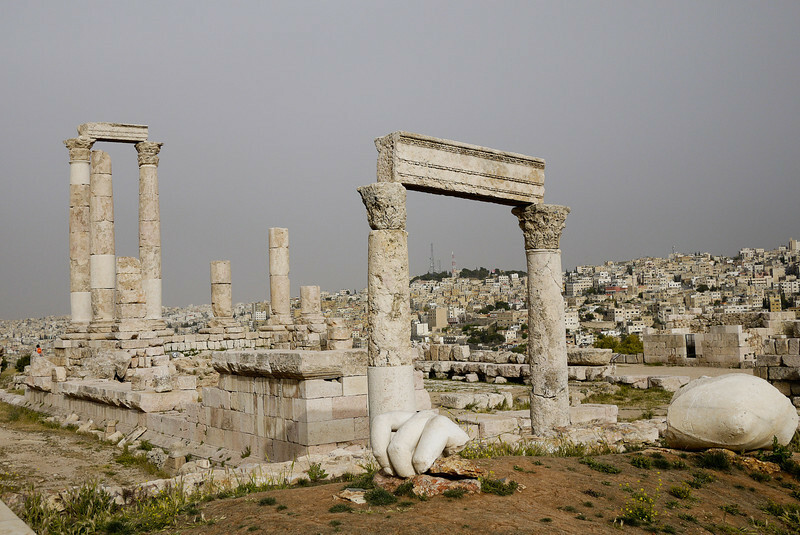 Amman, Jordan is a city comprised of seven hills, and the one holding the Temple of Hercules isn’t especially different than the others. It’s not taller. It’s not greener, pointier, or in some way more “hilly.” Yet the ancient Romans chose this specific hill, of the seven, to hold the Temple of Hercules and a Byzantine church. 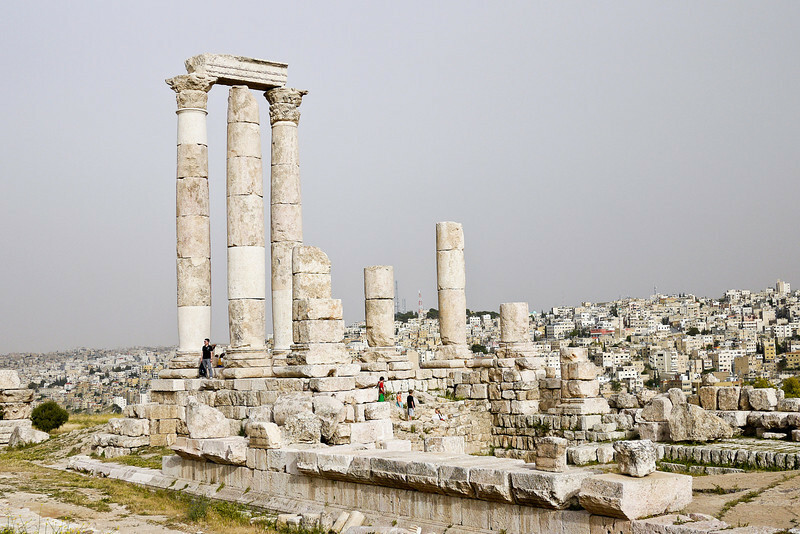 Amman’s modern appearance, however, belies it’s ancient history dating to the neolithic period and considered among the world’s oldest continuously inhabited places. 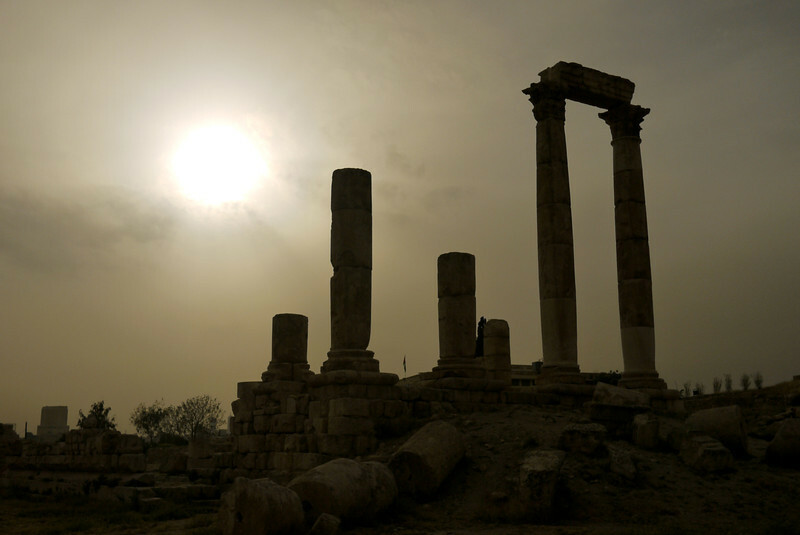 The Citadel dates from AD 162 to 166—which puts it smack dab in the middle of Amman’s period of Roman occupation during Marcus Aurelius’ time—and some say that the structure itself was never finished since there are missing columns and other archaeological evidence missing. What was left, however, is huge on an unprecedented scale. I’ve stared in wonder at Rome’s most impressive legacies: the coliseum, the Pantheon, the Forum, and more. And yet, the Amman Citadel would have been larger than anything in Rome. The Citadel itself would have been impressive in scale, but it’s the statue of Hercules that tickles the imagination. Just hearing the name Hercules and in an instant my mind fancifully wanders through Greek history and mythology. Citadel ruins on one of Amman’s seven hills. As the illegitimate son of Zeus and Alcmene, Hercules has long held a fascination for me, and likely not just me. Greek mythology paints Hercules as a human as much as he was a demigod—as strong and powerful as the Gods, but riddled by earthly disputes and relationship drama. He’s a hero, but relatable. His fallibility makes him infinitely more interesting than perfection. 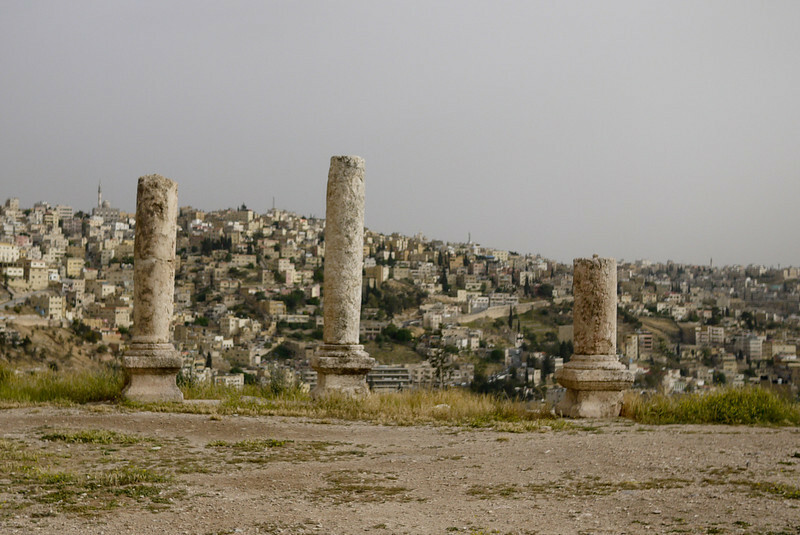 In Amman, Citadel Hill (Jabal al-Qal’a) stands out because it’s located in what is now the heart of downtown, modern Amman but also among the oldest parts of the city. While rectangles of housing jut up from the terracotta earth on the other hillsides, Citadel Hill is so much more than merely a spot for holding the city’s occupants. 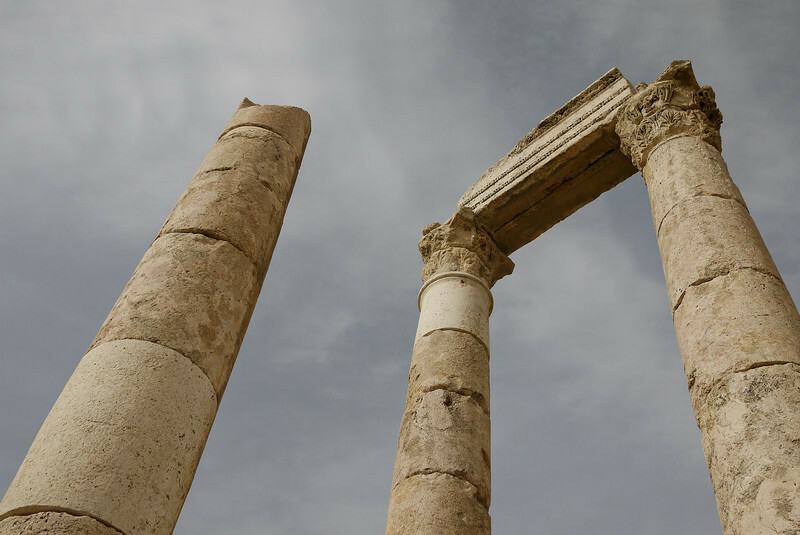 Instead, you can admire the the tall, white-marble temple columns from the rest of the city, the view serving as an unavoidable reminder of Jordan’s pivotal place in ancient history. 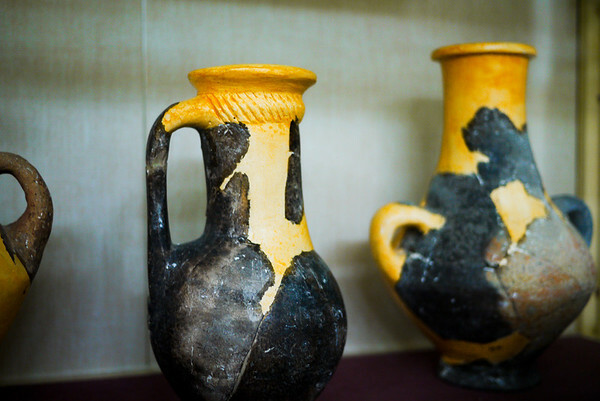 Archaeologist believe luck played somewhat into what is left standing today, even if it appears as just crumbling marble columns. 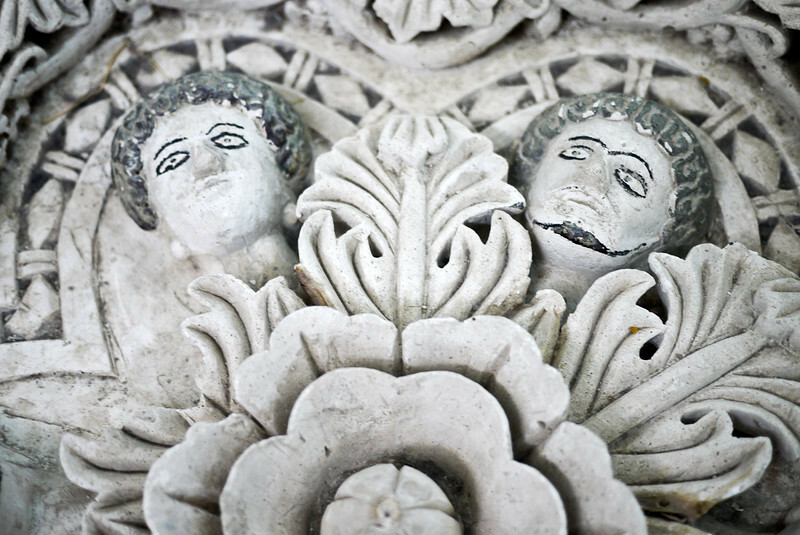 Parts of the Citadel complex, including the Temple of Hercules, were likely cannibalized to build the nearby church, and some even joke that part of the temple may, in fact, have become beautiful countertops for Amman’s citizens. Left unfinished even nearly two thousand years ago, despite having been commissioned by the powerful Marcus Aurelius, the marble would have been easy prey for other projects, particularly if it was already in pieces because of an earthquake. 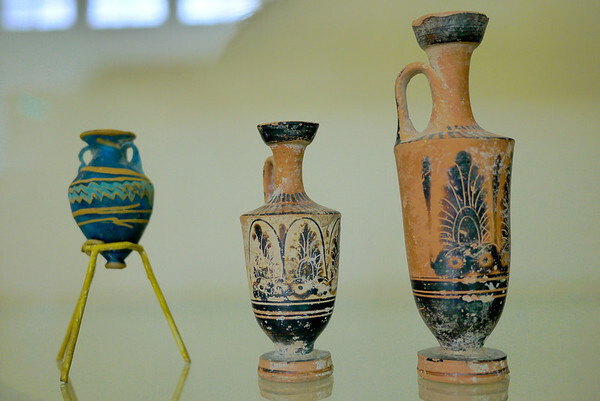 An earthquake is leading theory about what took down the State of Hercules. All that’s left of this mighty statue is a set of three fingers crawling over the side of the hill and a huge white fragment of elbow—by examining these pieces alone archaeologists have concluded it was Hercules this statue honored. The statue graveyard elicits its own mysteries if if you know naught of the Citadel and Temple’s history. Two pieces of a once magnificent statue that no longer stands lay littered on the ground in front of crumbling marble columns. The story gets even better when you know the specifics, however. The Statue of Hercules would have stood as much as 42 feet high (13 meters) according to archaeologists—it was 39 feet tall at a minimum, which would make it among the largest known marble statues in the world. That hand on the ground of an ambiguous size, it’s huge, as is Hercules’ elbow nearby. Though only fragments of the statue remain, I find myself still thinking about the enormity of this statue, what an ancient visitor must have thought as they stood on a nearby hilltop and looked at a colossal, white human-like figure dominating the distant skyline. I can’t help but gaze at the city of Amman and imagine the glory of this hill during its heyday. Getting to the Citadel: Take a taxi up and walk down if you’re up for it as it’s a beautiful way to enjoy the views and vibes. If you’re really fit, you can walk up from the amphitheater. The Citadel ticket office is located on the path to the Citadel, so you can’t miss it. Timing: We visited in the late afternoon and it was lovely because the tour buses had already left. Take heed of the time though if you plan to walk as you should not walk home after dark. 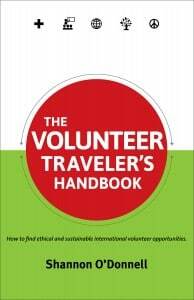 Stay Safe: Jordan has significantly different vibes than other places in the region and you can absolutely travel here. That said, the are very remote areas of the country where getting sick and needing emergency medical treatment would be expensive, so I recommend you carry travel insurance while you are here. Plus, the drivers are crazy at times, the road rules differ from North America, so be sure you can afford medical treatment if you get in an accident. I used World Nomads for this trip and highly recommend it. 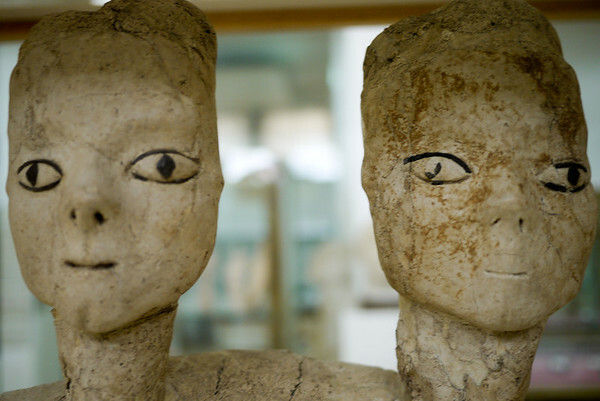 Getting Around Jordan: Jordan on the whole is fairly easy to navigate by public transport, although many travelers rent a private car and explore that way since there are a few key sights you really need a car or a day tour to visit. Use the Lonely Planet Jordan to find the most updated transport options around the country as it’s your best bet at understanding how to navigate between places, as well as knowing which neat smaller sights you can visit along the way if you’re road tripping! Jordan is one of those places that should be seen in a lifetime. 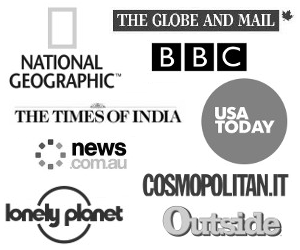 Pity it doesn’t get more world promotion on the many historical sites it has. Your welcome.. Great photos by the way. Its good to see some preservation going on in Jordan if not so well highlighted as a place to visit. I remember artifacts being found in a new road development here that seen most of it disappear by workers who sold it to private collectors. Sad to see especially when its their history they are selling out. Goes on around the world but here in the Philippines I find people are struggling more for a historical connection than anywhere else I have been. I saw the enormity. I guess your friend must have been thinking about all the trick photography out there these days that make objects appear larger than they seem. That didn’t even cross my mind, I just saw a huge hand. You are right, imagine what people thought of that statue when it was standing. Wow! Great photos Shannon, we didn’t make it to the Citadel Temple when we were in Jordan, wish we did! I definitely saw an enormous hand at first but I’m not sure if that was because I’d already read the title with Hercules in it. Either way, it’s fun to see the two different perspectives of either a hand holding onto a cliff or just a hand in the dirt next to other undoubtedly large ruins. That’s a very good point…it’s hard to imagine anything with Hercules in it’s name as minuscule and tiny :) Thanks for weighing in Cat! There is something deceiving in the weeds, and the out-of-focus foreground and background, that make it look like something you bought in a museum store and laid there for a photoshoot. The last photo of your post, of course, settles that doubt. Thanks for opening a window into this mysterious place. It’s intriguing that the focus gave it such a mysterious quality (I am now filing that trick away in my head for future, purposeful use!). 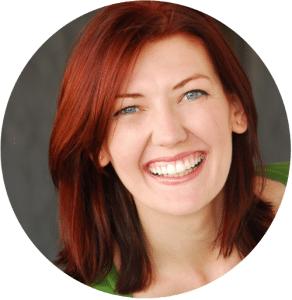 Thanks for stopping in and sharing your perspective, have a wonderful weekend! For the first photo, I would have to say creeping fingers in the dirt. While I knew that it was big, it didn’t look that way in the photo because the foreground looks you were really close to the ground. However, seeing it from a distance and reading that it was 42 feet high, I can only imagine what seeing the full statue would look like in person! I thought it was big in the first photo, but I definitely didn’t think it was as big as it looks in the last photo. Did you use a Tilt lens? That’s so awesome. Jordan is definitely one of the spots I want to hit up…seems more down the ‘road less traveled’, which is always nice! I thought the hand would be HUGE judging from the first photo…but you’re right, perspective does factor in a lot! I think it can go both ways, but at first glance, I thought it was huge. Maybe because of the city behind it. Are there two different Hercules’ hands or is the first pic a different angle on the last pic? Yes, perspective. Ever elusive w/o some universally known object adjacent to show relative size. A flower amid the fingers would do nicely, but it doesn’t look like any such greenery might be found in that area. I really liked this piece. The first picture shows it being either large or small…I saw large and others might see small. I think that is the best part, perspective.